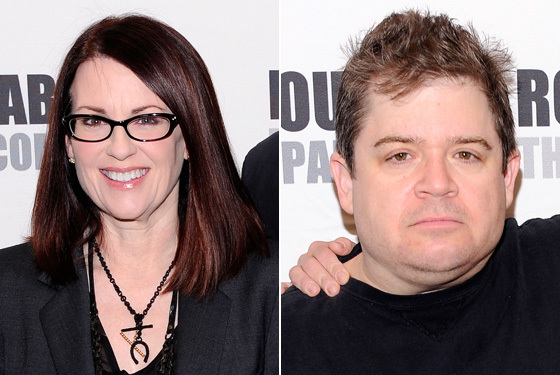 Did Megan Mullally Quit Broadway’s Lips Together Over Patton Oswalt’s Acting? Why Did Megan Mullally Quit Lips Together? On Tuesday, Deadline’s Mike Fleming reported that Megan Mullally had abruptly left Broadway’s Lips Together, Teeth Apart because she was fed up with director Joe Mantello’s “abrasive manner.” Yawn! Last night, though, Fleming floated another more interesting theory: Mullally may have quit following an unsuccessful bid to have fellow cast member Patton Oswalt replaced. A person who observed rehearsals for Lips tells Fleming there were “moments of tension” between Mullally and Mantello, and some of them had to do with Oswalt’s inexperience in live theater (Lips is his Broadway debut). Oswalt (who was great in last year’s Big Fan, by the way) allegedly “took … more time to warm to the pace” than any of his co-stars, all of whom have other shows under their belts. We were surprised and disappointed that Megan Mullally had to withdraw from the production immediately in breach of her contract. With the loss of Megan in a four person ensemble, work has been delayed after only two weeks of rehearsal. We have wanted Joe Mantello to direct this comedy since he staged a reading for us three years ago. We expect to announce replacement casting shortly. The first preview performance will be delayed. The opening night date remains April 29th. Joe and I were thrilled to be in the rehearsal room with these four actors. Joe is my longest and one of my most trusted collaborators. We have waited and worked for almost three years to make this production happen. Megan Mullally’s decision to withdraw at this late date is devastating.